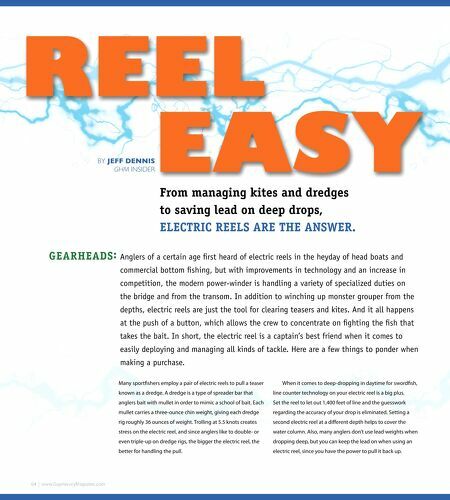 BY JEFF DENNIS GHM INSIDER From managing kites and dredges to saving lead on deep drops, ELECTRIC REELS ARE THE ANSWER. GEARHEADS : Anglers of a certain age frst heard of electric reels in the heyday of head boats and commercial bottom fshing, but with improvements in technology and an increase in competition, the modern power-winder is handling a variety of specialized duties on the bridge and from the transom. In addition to winching up monster grouper from the depths, electric reels are just the tool for clearing teasers and kites. And it all happens at the push of a button, which allows the crew to concentrate on fghting the fsh that takes the bait. In short, the electric reel is a captain's best friend when it comes to easily deploying and managing all kinds of tackle. Here are a few things to ponder when making a purchase. Many sportfshers employ a pair of electric reels to pull a teaser When it comes to deep-dropping in daytime for swordfsh, known as a dredge. A dredge is a type of spreader bar that line counter technology on your electric reel is a big plus. anglers bait with mullet in order to mimic a school of bait. Each Set the reel to let out 1,400 feet of line and the guesswork mullet carries a three-ounce chin weight, giving each dredge regarding the accuracy of your drop is eliminated. Setting a rig roughly 36 ounces of weight. 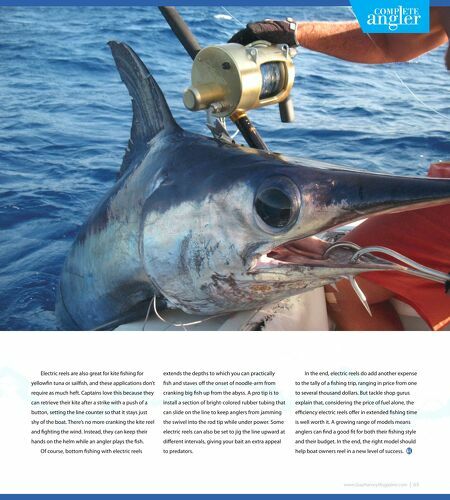 Trolling at 5.5 knots creates second electric reel at a diferent depth helps to cover the stress on the electric reel, and since anglers like to double- or water column. Also, many anglers don't use lead weights when even triple-up on dredge rigs, the bigger the electric reel, the dropping deep, but you can keep the lead on when using an better for handling the pull. electric reel, since you have the power to pull it back up.